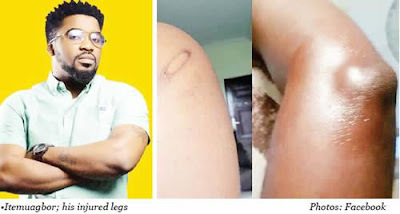 A victim of Special Anti-Robbery Squad’s brutality, Vaughn Itemuagbor, has said his last ordeal in the hands of the officials of the Nigeria Police Force in Rivers State on Sunday would be the second time he was tortured. Itemuagbor’s story was shared online, where he lamented his ordeal in the hands of the men of SARS. He also shared pictures of the bruises he sustained. Speaking with Punch on the phone on Sunday, Itemuagbor said he wanted to get food in an eatery when he was flagged down by the SARS officials. Recounting his ordeal, Itemuagbor said, “That Sunday experience was the second this year. I was first arrested in March when I was driving to the office. I was flagged down by policemen and asked what I do for a living and I told them that I am an IT consultant. They said I was an internet fraudster and they took me to their office. “I was with my girlfriend that day; and we were in their office from 11am to 4pm. After lots of pleading, they asked me to give them money, I did and they set us free. “Last Sunday, which was my second experience, I went to get food in an eatery when I saw some guys behind me in a Toyota corolla waving me to stop; initially I thought they were kidnappers because they all wore black clothes. “I wanted to speed off but I later realised that they were SARS officials, I stopped the car and wind down the vehicle’s glass. One of them came to meet me and said I wanted to run away and I said no. “I greeted them and they asked who I was and I told them my name and my occupation; they asked for my ID card and I showed them. “After showing them my ID card, they said they know who I was. “I was asked to open my Facebook account While one checked through my phone, the other official said we should go to their office. “I asked him who are the ‘you people,’ but he didn’t answer me and said that if I got to their office; I would answer any question they asked me. “When we got to their station, I was asked to take off my shirt and trouser and sit on the floor. “I was asked again what I do for a living and I told them that I’m an IT consultant and they gave me a hot slap; one of them came with a big stick and started hitting me. At this point I was confused, I don’t know what to do again. “They gave me a paper to write a statement, I was asked to confess to being a ‘yahoo boy,’ a popular slang for an Internet Fraudster, but I protested that I was not and they slapped me. “One of them that didn’t join them to torture me later came to meet me that I should just write whatever they want me to write and they would release me, I was forced to admit that I was a yahoo guy. “They came to ask me about what I could offer them and after much talk; they said I should give them N1m. “I told themthat they should just kill me there because I did not have that kind of money. They said I should raise N500,000, but I told them I don’t have the money. “They told me to call my people, but I told them that I did not have anybody. Then, they asked me to write in my statement that I offered them a bribe to facilitate my release. Itemuagbor called on Inspector General of Police to save him from harassment, adding that he was ignored when he reported the matter at a police station. The spokesperson for the state police command, Nnamdi Omoni, had said the complainant should come to his office.